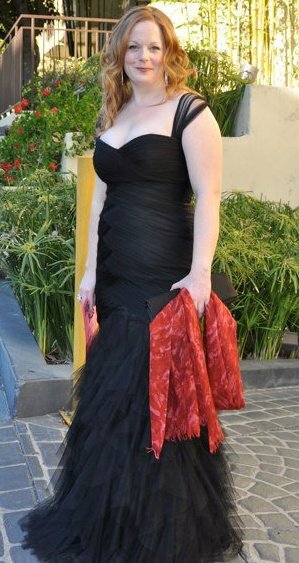 Here I am, ridiculously nervous standing outside our hotel in West Hollywood, waiting for my taxi to Elton John's Oscars Party last Sunday night. 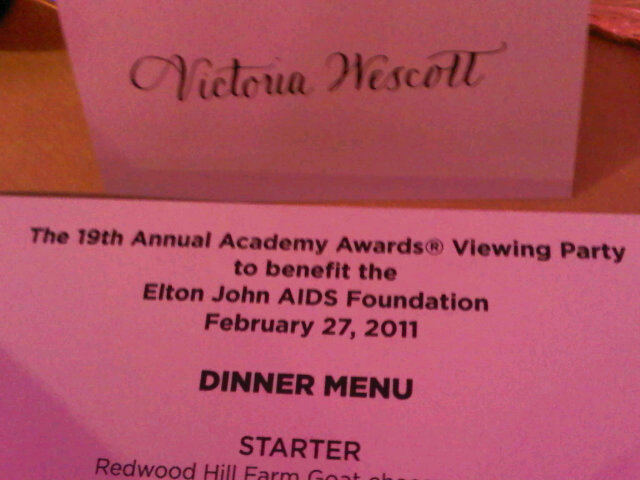 I was one of less than 1000 people who were lucky enough to attend the event. My sister, Jen Westcott, the writer/director in our team, opted out of the party so she could enjoy the luxury of watching the awards from the hotel room without her 3 kids crawling all over her. She ordered room service, had a glass of wine & enjoyed the solitude. Jen's also a bit of my opposite in that she's much more shy than I am. Most people would never know that to meet her, but it's true. The whole idea of a schmooze-fest like Elton John's party just doesn't turn her crank, whereas I love that kind of thing! Guess that's why I'm the producer eh? They mispelled my name...but I didn't care. 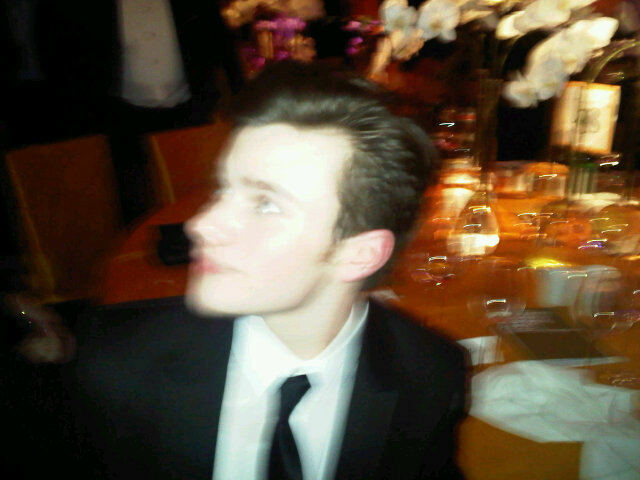 I tweeted it anyway! There's an article all about my experience in today's Times Colonist which you can read here. Read all the way to the end to hear about stars using the porta-potties. 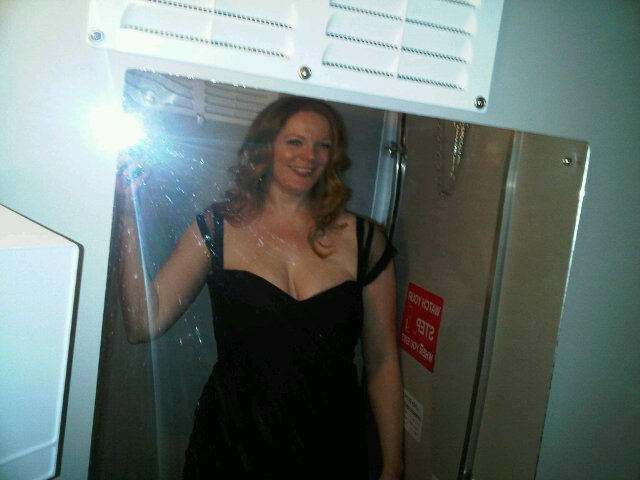 Here I am proving that indeed - the washrooms were porta-potties! And no VIP loos either. Imagine being in line when Heidi Klum needs the loo. Yeah, that's exactly what it was like. Too funny! There were a few highlights for me in particular. Seeing Florence & the Machine perform in such an intimate setting was absolutely the best thing that's ever happened to me. I only recently bought their album, and while I enjoy it, it's nothing compared to seeing Florence Welch belt out those tunes in person only a few feet away from my table. That woman has a voice and a half! *This isn't my video, but I found for anyway! 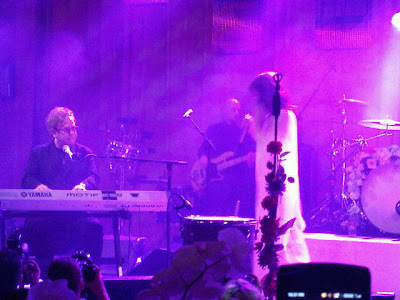 When Elton got up to perform with her, the whole room erupted. And then, to top it all off, Florence had us jumping up and down in our highest heels! It was AMAZING. My feet killed afterwards, but I was a proud jumper who couldn't care less in that moment. Plus, I was dancing right beside Jenna Ushkowitz who was also seriously loving the performance. We joked that it would be incredible if Florence came on Glee. Also, meeting Chris Colfer and Ashley Fink from Glee. Amazing. Saw Glee on Oprah last year (before Ashley had joined the cast), and as a former teacher, I'm their biggest fan and told them as much. Very cool kids! 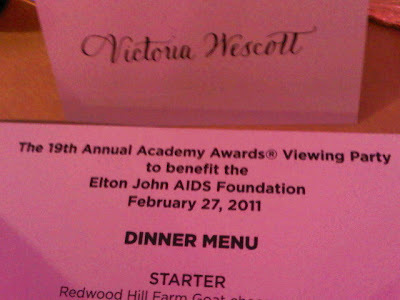 And of course, the speeches about HIV/AIDS and what the event was all about were pretty amazing. 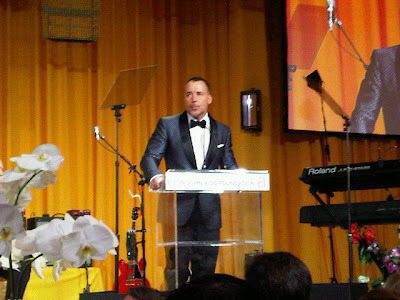 David Furnish (another Canadian and Elton John's husband) spoke eloquently and inspired us all to take more action. I hear that 4 million dollars were raised that evening. Wowsers! Now, if only a few of those folks would spare a couple more dollars for our kickstarter campaign.... cough cough. As for the actual awards ceremony, we watched the Oscars during dinner (which was incredible btdubs) - so that means, we didn't actually get to hear most of the speeches as people chatted throughout. As a movie lover, I gotta admit - I was kind of envious of Jen back at the hotel room watching in silence from home. 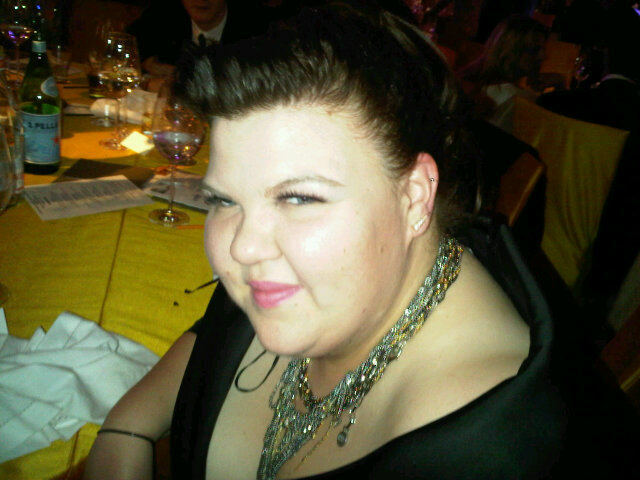 Not that I would have traded spaces with her for anything - I just like watching the Academy Awards! So, I'll do as my host says she does - watch it tomorrow after I've slept and caught up on work stuff. I know, I know - you'll tell me that it was a trainwreck and the worst academy awards ceremony in the history of awards ceremonies (that's what twitter's all a'buzz about anyway) but I don't care. Because when I watch the awards, I'll be thinking: that it just might be my sister up there one day, accepting the award for best original screenplay, or best director, or hey, even me for best picture. Not that they ever award "coming of age comedies!" but in the words of Justin Bieber, never say never. More stories & photos to come I promise! But right now, back to plugging our kickstarter campaign to death. I know you're sick of it. I am too. But just pledge what you can, post it, repost it and then we'll all return to life as normal, but this time with enough money to make our movie! Come on folks. WE CAN DO THIS! 70 people have backed us so far, we have only 3 days left and if I can get invited to Elton John's Oscars party after making a goofy beatbox video with my sister and some of our cast in our garage, then by George - surely we can raise $15 000 before the campaign ends in just 3 days. Right?! Are you with us?